When I found out there was a local meadery not too far from me, I had to visit! Yes, its not cider, but I find mead to have some similarities, and I like it, and its my blog. I hadn’t thought I liked mead, after trying two varieties I thought were pretty horrible. However, lately I’ve had some selections from Moonlight Meadery (out of NH) that were quite awesome. I found out about Æsir (pronounced ah-see-er) Meadery from Erika of Full Throttle Bottles, who posted a link to vote for them for the best “winery” of Western Washington (a yearly King 5 News series). By the way, through the power of social media, Æsir Meadery has been battling for the lead with the usual yearly winner (and traditional grape winery) Chateau Ste. Michelle. Æsir is much much smaller than Chateau Ste. Michelle, been around for much less time, and doesn’t even make traditional wine! The voting is far from over though, so we’ll see how it turns out. Mead by the way is technically a type of wine, but it is made from fermenting honey & water. 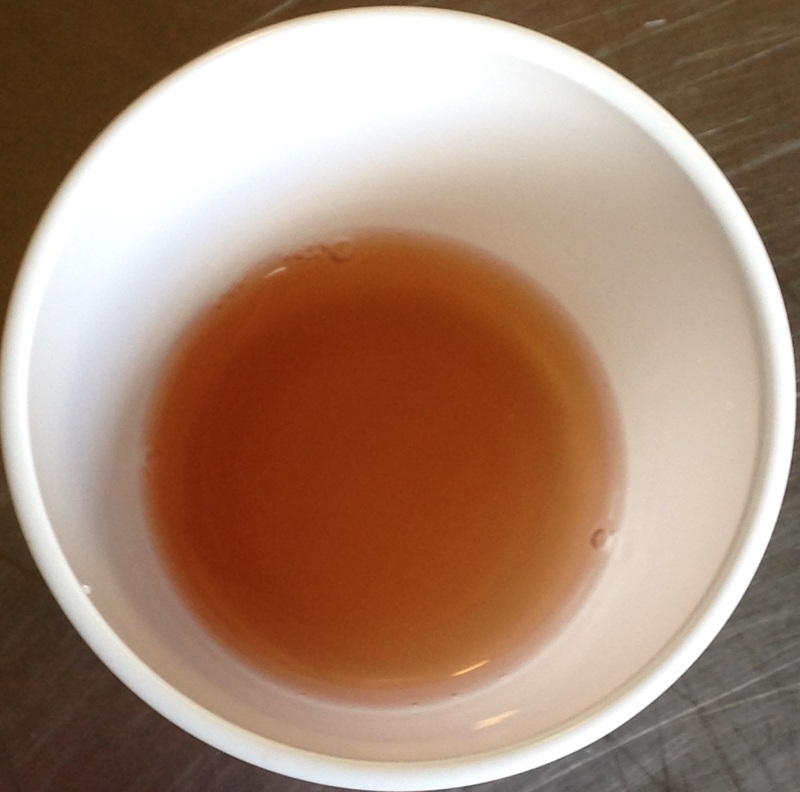 Mead usually has an ABV similar to grape wine (Erik’s varieties appeared to range 11-17%), and may be drier or sweeter. Æsir had selections from dry to sweet, although more sweet than dry (I didn’t find any to be overly sweet either). I was able to try 7 selections, 5 of which were available in bottles to take home that day. 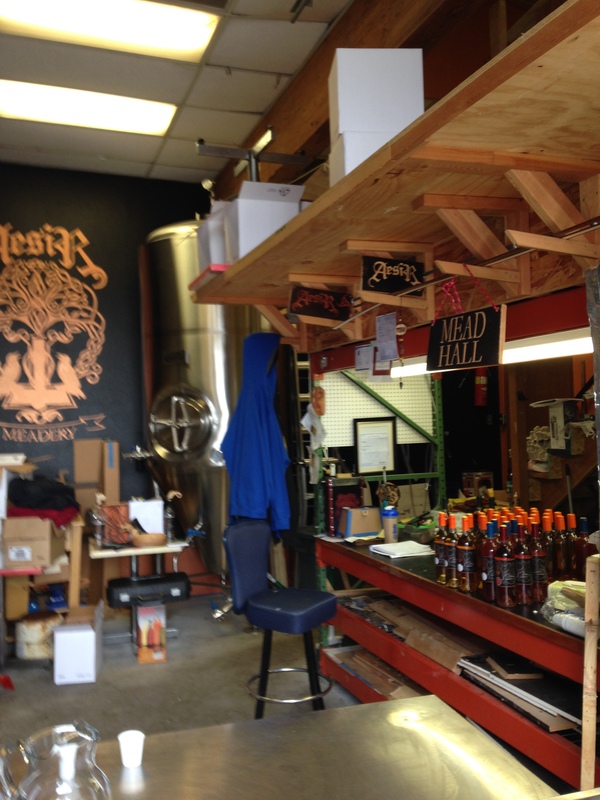 Æsir is definitely a micro-meadery, and is currently operating out of a garage literally in an alley. Everything is done by hand (he unfortunately has never used his awesome steel tank pictured below) and its definitely a labor of love. His methods however have advanced a bit from the olden days of mead. Mead is thought to be the oldest alcoholic beverage. It was originally discovered when a bee hive with honey would fill with rain water and the wild yeast would ferment it into mead. The mead making process was then moved inside, and made purposely, where they would ferment it in barrels. If they found a batch with a yeast strain they liked, they would stir it with a “yeast stick” (giant wood paddle) and save it for their next batch. Erik still uses the yeast stick method! He described starting out with commercial yeast strains, but happened across a strain he liked better, and continues to use it. Note that Erik only minimally filters the meads as filtration can also remove flavor. I thought that sampling mead in the alley out of little plastic cups was more legit than many of the fancy tasting rooms which make you question whether they actually make their products there! 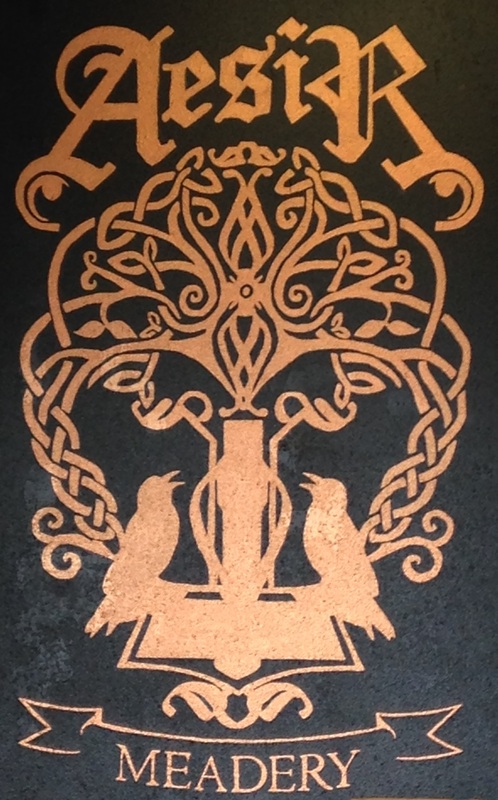 Æsir Meadery is currently open Thursday-Sunday, noon-6pm, in downtown Everett WA (2625 Colby Ave). I visited with my husband on a Saturday, just after noon. We had two folks we didn’t know who joined us in our tasting as they were there at the same time. 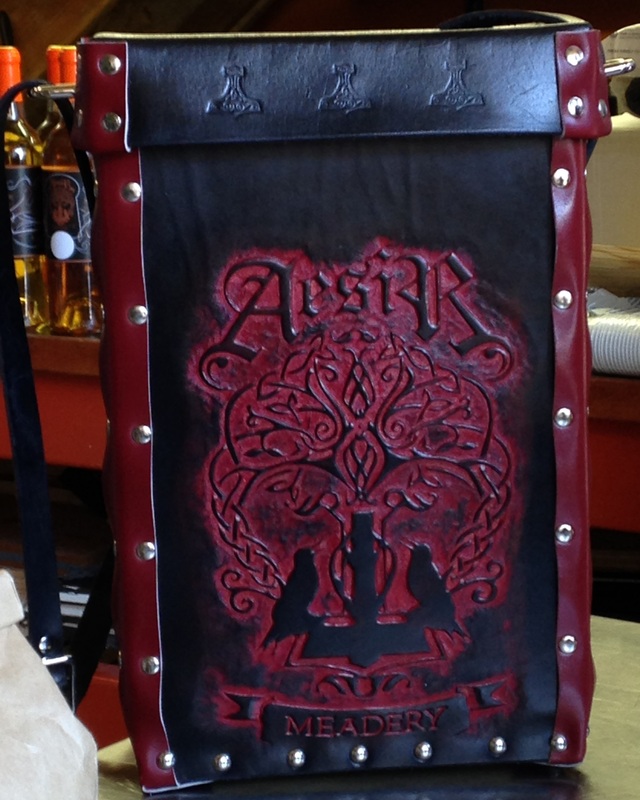 Æsir is a one man operation, started & run by Erik Newquist. 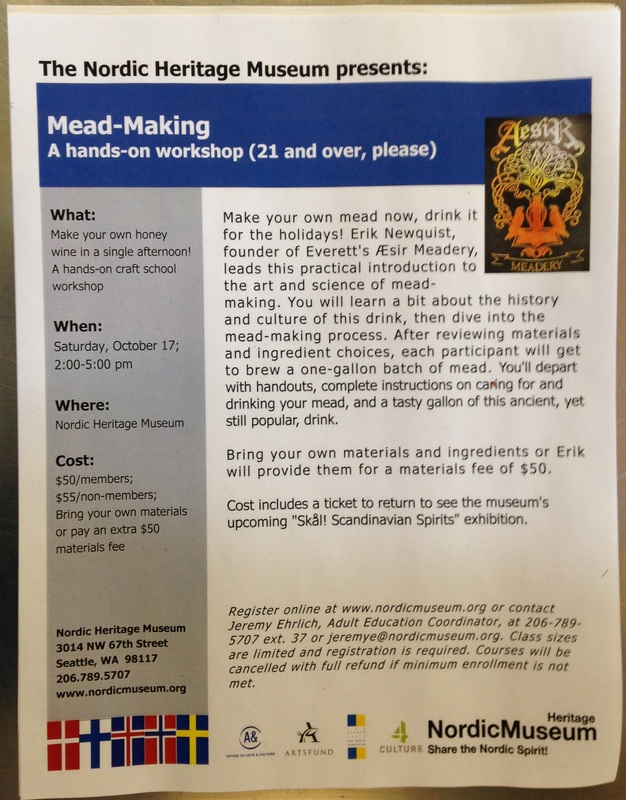 He has degrees in Microbiology and Chemistry, which brings a scientific background to the art of mead making. 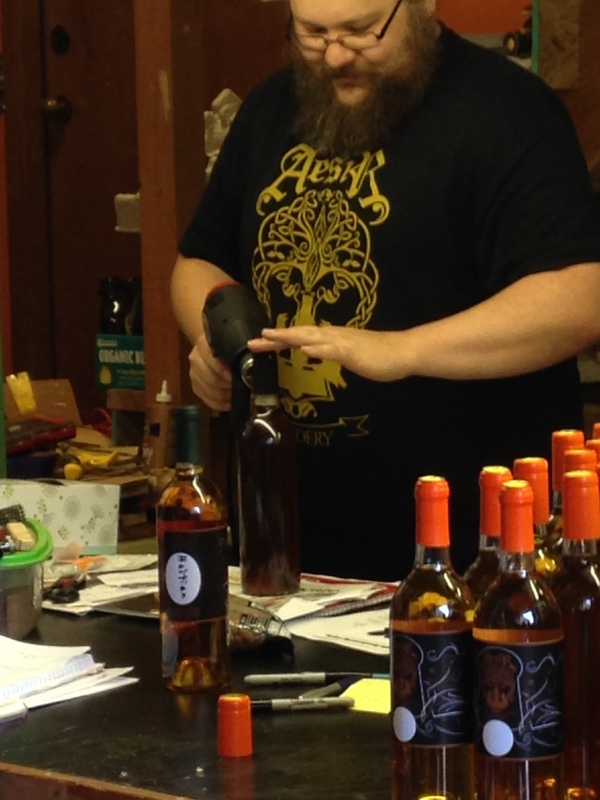 Erik has been making mead for over 14 years, but established Æsir in 2012. 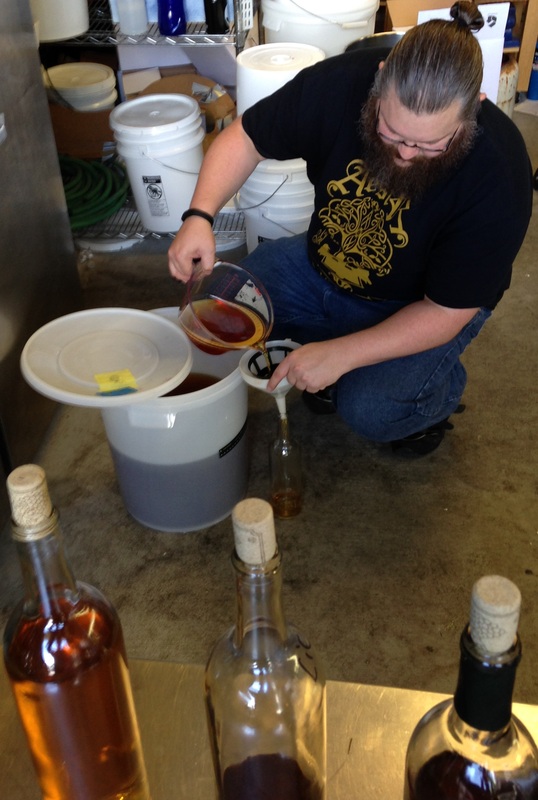 He started making mead in college (Oregon State in Corvallis) with his roommate. The mead making continued after college, but only for himself, parties, gifts, etc. After spending time at unfulfilling corporate jobs, he decided to make the jump to starting a mead making business. That process started in 2011, with a class on writing a business plan, and overall strategizing. 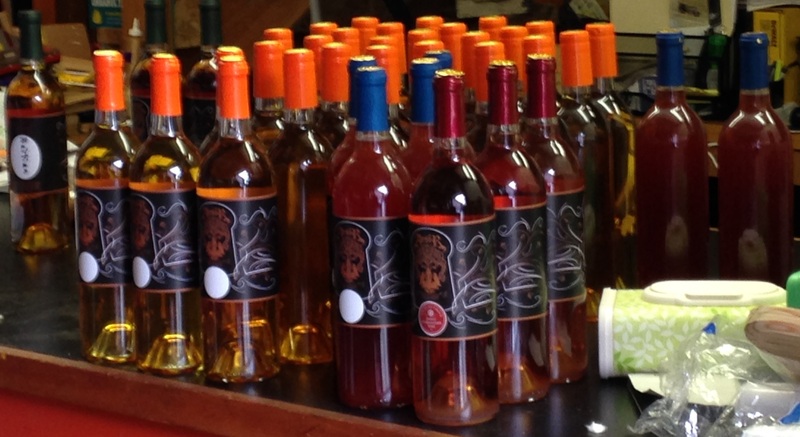 The first commercially available bottles of Æsir mead were sold in April 2014. The company name and logo is based on Nordic mythology, a nod to Erik’s Scandinavian heritage. Check out this issue of American Mead Maker starting on page 11 for an article on the birth of Æsir Meadery! Erik uses local WA honey and as many other local ingredients as possible (except when for example a fruit or spice isn’t grown here). Although honey is primarily produced in the Spring & Summer, thankfully it is available year-round, including in a 700 lb barrel size that Erik has used! It was clear that he loves what he does. Although mead is very much a niche beverage (much more so than cider), there are actually a few other local meaderies in the area, both smaller & larger, and plans in work for a few more. Erik doesn’t sell any kegs at this time, but is working on it. His bottled mead can however be found in a few Seattle area bottle shops (such as Full Throttle Bottles & Special Brews) and restaurants/bars, which he self-distributes to. He is also working on getting in with VinoShipper, which would enable his meads to be sold online and shipped to 21 states! Due to his planned meadery move and current projects (the “tasting room” is his workshop after all), the garage was a bit of a construction zone, so I wasn’t able to get the greatest photos. My tasting notes really don’t do Æsir’s meads justice. I’ll admit I have little mead experience, so I’m not even going to try to do full reviews…just list what I tried, a few notes, and my favorites. Blackberry Honey (Nott, meaning Night): Made using blackberries from Tulalip WA and blackberry honey from Eastern WA. Dry to semi-dry. Milder blackberry-honey flavor, tart, with some citrus notes. Pomegranate (Slip of the Tongue): Made using fresh pomegranites (from Southern CA as they aren’t grown in WA). Semi-dry. Tart pomegranate-honey-berry flavor. I picked up citrus in this one again, which Erik commented was likely from the yeast strain he uses. Haitian Spice: Made using buckwheat honey from Arlington WA with a secret family blend of spices from a friend of Erik’s. This was originally made specifically for a “Game of Thrones” event, but it was a big hit, so the variety has continued. Semi-sweet to sweet. There was definitely a lot of spice with this one, not just in amount, but complexity. I honestly wasn’t a fan of this one (too much spice for me; I don’t usually like spiced anything). It was however the favorite of our tasting companions. Erik wouldn’t share all of the proprietary spices, but we learned they include a bit of habanero and orange rind. I picked up cinnamon & cloves, but apparently they weren’t included. Its interesting what we can pick up in an alcoholic beverage that isn’t actually there! I’ve definitely learned this from my cider tasting experience. This mead has a unique smokey / tobacco-type flavor which was probably my favorite part of it. Licorice Root (Hunter’s Blessing): This isn’t the black licorice (anise & fennel) that we think of, but was made using the milder root of the licorice plant and blackberry honey. Sweet. He didn’t tell us at first what the flavor was, but wanted us to guess. I was thinking caramel, but not quite. There was a bit of burn with this one too, but not nearly as much. We started out drinking it just below fridge temperature, but Erik set up a sweet plastic cup double boiler using warm water and had us heat up the mead a bit. Wow–what a difference. A completely different (mellowed) flavor profile. I honestly didn’t like it cold, but when warm, it was amazing! Citrus (Midsummer’s Sleep): Made using mineloas, naval oranges, and Marshall lemons from the Farmer’s Market stand up the street from Æsir in Everett WA, with blackberry honey. Semi-sweet to sweet. Bold citrus flavor without too much tartness, and without the citrus overpowering the honey notes. Yum! I also liked this one best warm. I’m a huge citrus fan, especially lemon. My husband thought this would taste awesome with hops, and Erik said he is looking into it. So, those were the five varieties he had available to buy bottles of. 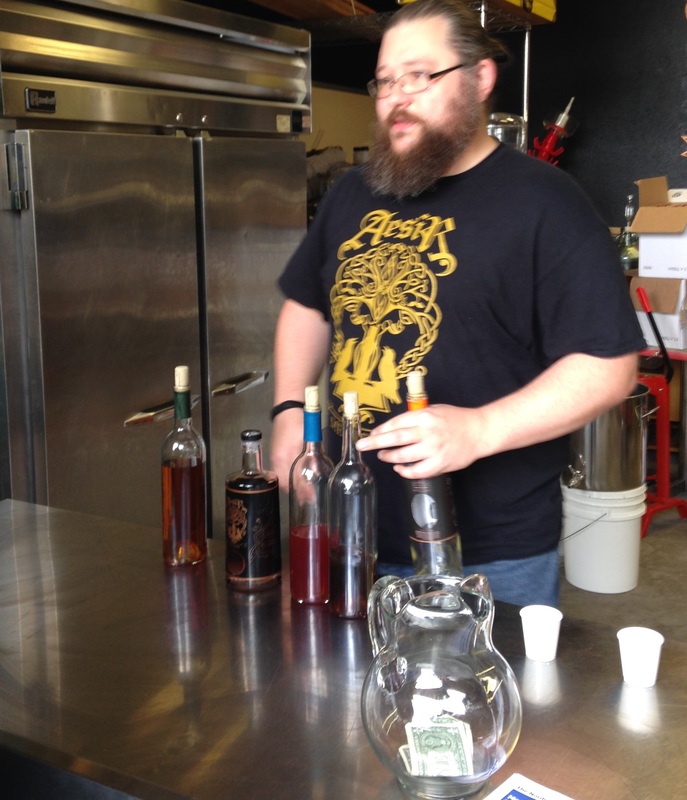 We also tried one experimental batch, and some of his “Traditional” mead he found a sample size bottle of! (he thought he was completely out) He had an entire table of experimental batches plus more in the fridge. The weekend we visited he also started a batch of peach mead, which sounds amazing. Madagascar Vanilla & Spanish Saffron: This was one of those lets see what is in the kitchen pantry to add to mead sort of experiments. Semi-sweet to sweet. I picked up the vanilla, but wouldn’t have been able to identify the Saffron. Again, the additions were nicely done and didn’t overpower the mead’s honey notes. Traditional: This is a mead without any other flavor additions. Sweet. Lovely honey flavor (and even texture). Its really hard to come up with any actual descriptors, but it was amazing! Some honeycomb and floral notes. I thought this mead was a bit more viscous than the others, which I like. Very complex for its simplicity. My favorites were the Traditional, Citrus, and Licorice Root. We learned he is barrel aging his Traditional mead in two small Woodinville Whiskey barrels for a year and a half. I really want some of that! It will be a small release in the near future, probably about 70 bottles max (although the barrels are 8 gallons they lose some mead to evaporation). So, if you are interested, sign up for his newsletter on the Æsir Meadery Facebook page so you’ll be notified when it is released. I love barrel aged ciders, so I’m really looking forward to barrel aged mead! I ended up purchasing a bottle of Citrus ($25 for 750ml, which I think is very reasonable given the product). I would have liked to get several bottles of mead, but I have way too much cider at home to be buying mead on top of that. I was very happy to learn however that Erik has found his meads can last weeks or more in the fridge after opening (as long as they are well-sealed), as they don’t oxidize nearly as quickly as wine. He was out of Traditional (my favorite), so I had to decide between the Citrus and Licorice Root. My husband’s choice was Citrus, so that is what we bought! I couldn’t fathom walking away from there empty handed, so one bottle seemed like a good compromise. 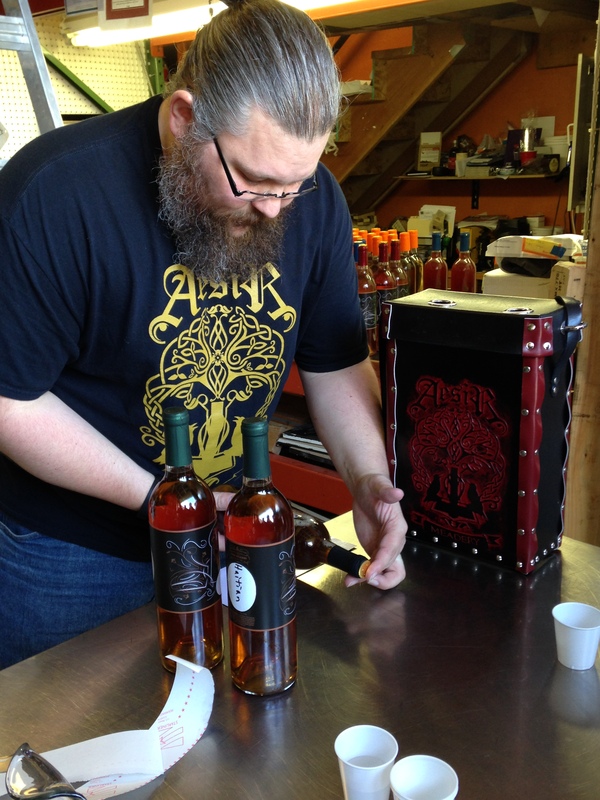 I hope you enjoyed this writeup from my visit to Æsir Meadery! Have any suggestions for Seattle-area places for me to visit?